Barlow Farms started when the Hall family came over from Scotland in 1843. The original house still stands on what is now Southbrook Golf Course just south of Binbrook. Much of the original land is still in the family and has been cropped for over 150 years. The farm was a mixed farm with grain, hay, livestock and lumber being produced up until around 1950 when cash cropping and dairy became the predominant businesses. Earl & Joan Barlow took over the family farm in 1970 and sold the dairy. 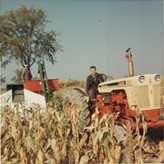 Cash cropping has been the mainstay ever since. 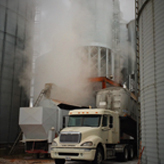 In 1979 a public grain elevator was built on an adjoining property and grain from all over was brought in. Since then the elevator has had up to three dryers, a cleaner system installed and tripled in capacity. Nowadays the elevator is not public and is only used for processing and storage of grain for Barlow Farms. Earl is still a driving force on the farm after 45 years at the helm. Earl spends time in all the equipment and is very keen on the grain markets. Earl enjoys local history and explaining the “way it used to be”. When not busy at the farm Earl & Joan enjoy relaxing on their boat in Port Dover and also travelling to warmer climates during the winter months. Jeff manages the field operations and maintenance side of the business. He has been back on the farm for 12 years now after attending university and working in a business development role for a global coatings manufacturer. He enjoys time out in the field but also spends a great deal of time in the office. On weekends he likes camping with his family in their 5th wheel as well as fishing and snowmobiling. Bob has been with Barlow Farms for over 30 years. He can do just about any job around here but spends a lot of his time running the grain elevator and driers. In his spare time Bob loves speed and can be seen at the racetrack. He even helps out a local SPRINT car team and spends his Friday nights in the pits. Paul does most of the trucking around here, is an excellent welder, and has been known to throw around a little humour. He devotes most of his spare time to his antique collecting including windmills, pumps, and tractors. Paul enjoys local history and loves all things Allis Chalmers. Frank has been with Barlow Farms for 5 years now and literally does ANY job you throw at him. He is experienced in almost all the trades and is eager to work on special projects and loves problem solving. In his spare time he likes travelling and is a director for his church. If it is sunny out you will catch him riding his Harley Davison.